This is the face of one of China’s most prominentaid projects in Africa, “agricultural technology demonstration centers,” or ATDCs, whose mission is to modernize African farming while also giving Chinese companies a foothold in new markets. There are now 23 of these centers across Africa. Here, at the China-Rwanda ATDC, Chinese agronomists teach local farmers the hidden benefits of mushrooms. They grow quickly, even in bad soil, and don’t take a lot of room. They pack in protein and other nutrients. At the end of five days of training, the students take a cooking class where they learn how to make things like liangban mu-er, a salad of “tree ear” mushroom paired with carrots and cucumber, or how to stew mushrooms in tea. Agricultural expertise is one of Beijing’s oldest diplomatic exports to the continent, dating back to the 1960s when government agronomists set up demonstration farms and training centers across the continent in the hope of spreading socialism to newly independent African countries. Rugaba Silas, an agronomist who later served as Rwanda’s ambassador to China, remembers how wary people were when the Chinese first came. A team of 10 Chinese specialists arrived in 1971 to take over a set of rice paddies left by the Taiwanese when Rwanda established diplomatic ties with China. “The Taiwanese dressed in the same style as the Rwandans, but when the Chinese came, they were basically dressed in uniforms,” says Silas, referring to iconic dark blue cotton uniforms worn by workers and technicians at the time in China. The team was slow to socialize with their hosts, in part because Rwandans were instructed to keep their new communist friends at a distance. “The Catholic Church would say not to invite them into our homes,” Silas said. While the goal may not-as some critics fear-be to use Africa merely as a farm for feeding China, neither is it entirely altruistic. The demonstration center in Huye, currently funded by the Chinese government, aims to eventually be a viable business that sells farmers material and equipment while also processing things like mushroom powder or dried mushrooms. Eventually these mushrooms will be sold to surrounding African countries as well as Europe and China. And the companies selling them will be Chinese, or Rwandese companies working with Chinese partners. “The very thing that the Chinese want out of Africa is not food. They want business opportunities. They want to create more market space for Chinese agricultural companies, more recognition that the Chinese are the true friend of African countries, and international recognition that China is a responsible stakeholder,” Yun Sun, a fellow at the Brookings Institution, tells Quartz. China is already the world’s largest producer and consumer of the “white vegetable,” accounting for 80% of the world’s mushroom production. These agricultural centers, then, serve a dual purpose: promoting China’s image in Africa as a partner that encourages self-reliance, while also providing a training ground for Chinese companies looking to expand. In practice, they show how blurring the line between aid and business interests is a complicated combination that produces mixed results for both China and its African partners. A few miles from the demonstration center is the Imanzi Spectrum Center, a cheerful white and mint-green cluster of buildings where Emeritha Nyivabizimana, one of Hu’s former students, grows and sells button and oyster mushrooms. Nyivabizimana uses equipment and material that she imported from China after spending three months there last year. One of Nyivabizimana’s biggest obstacles is that mushrooms aren’t popular in Rwanda. An old superstition-used for warning people against eating poisonous wild mushrooms-claims that a farmer who eats a mushroom will lose a cow. In the capital, Kigali, they’re served at upscale restaurants and hotels, but aren’t part of the traditional diet of most Rwandans. Nyivabizimana advertises on Facebook, selling to her neighbors, local grocery stores, and restaurants. She puts cooking suggestions on the packaging. Like the Chinese demonstration center, she holds classes on how to make things like mushroom soup or a mushroom cream sauce. Her ultimate goal is to convince local farmers to grow the mushrooms themselves and Imanzi will serve as a processing and distribution depot. “Our responsibility is to look for the market,” she says. Over the past five years since the Chinese agricultural center opened, Hu and his team have trained more than 1,000 Rwandans like Nyivabizimana in a specific mushroom growing method called juncao, or”mushroom grass,” invented by Hu’s employer, Fujian Agricultural University in southeastern China, in the 1980s. “The very thing that the Chinese want out of Africa is not food. They want business opportunities.” According to Hu, the juncao method is ideal for Rwanda because it uses grass and agricultural waste for the soil instead of sawdust from felled trees-the traditional method-and thus doesn’t require extra land to grow the trees on. Rwanda, with Africa’s third highest population density, is running out of land as its population expands. According to Hu, mushrooms turn a profit quicker than traditional crops grown in Rwanda, earning as much as 80,500 Rwandan francs (about $100) for one square meter (11 sq ft) after just eight days, compared to six months needed for sorghum or maize. 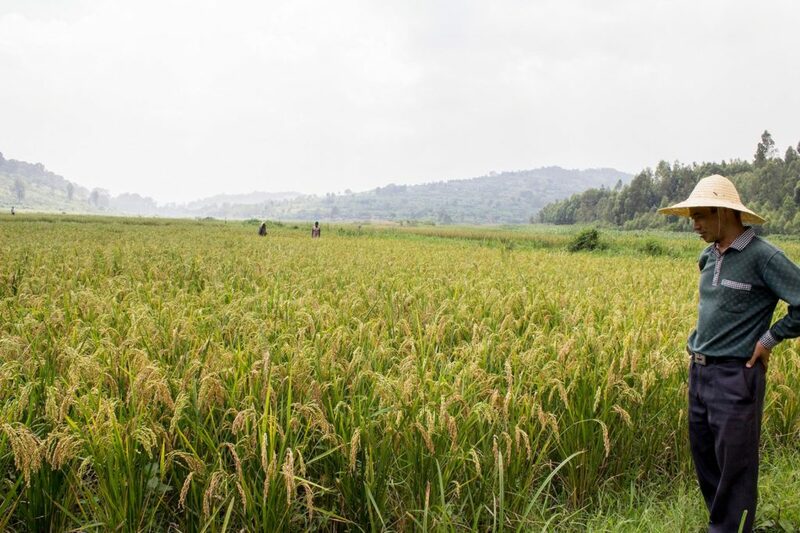 The grass used in juncao also prevents soil erosion, a problem in Rwanda’s hilly terrain. Dried mushrooms can also be stored for up to a year. Other entrepreneurs in Rwanda also see potential in mushrooms. “What I’m 100% convinced of is if we start now in Rwanda we will have all the first mover advantages. In the next 15 years, Rwanda will be the biggest producer of mushrooms north of the Limpopo River,” says Laurent Demuynck, head of Kigali Farms, a social enterprise that grows button mushrooms. According to Demuynck, mushrooms offer needed protein. Most households eat a combination of pulses, bananas, cassava, and sorghum, the most common cereal in Rwanda. Oyster mushrooms contain three times as much protein as sorghum, according to the US Department of Agriculture food composite database, and about a third as much as goat meat. So far, it’s still a slow-growing industry. Rwanda produced 70 metric tons (77 tons) of mushrooms last year, according to government data, a fraction of the estimated 1.5 million metric tons of maize (pdf) produced in the country each year. “People are starting to include mushrooms in their diet, but we cannot say that it’s something that is a huge deal,” says Geraldine Mukeshimana, Rwanda’s minister of agriculture. The mixing of business interest and aid is meant to make Chinese agricultural aid projects more viable in the long term. “The Chinese identified a problem with their past aid programs: as soon as they turned them over to the host government, the project benefits started to decline, maintenance fell, and output suffered,” says Deborah Brautigam, director of the China Africa Research Initiative at Johns Hopkins University and author of the recent book Will Africa Feed China? The Chinese approach to development cooperation does not separate aid, diplomacy, and commerce. Now, Chinese agricultural companies and institutions bid to build and operate demonstration centers. China’s ministry of commerce funds the centers. By the end of three years, they are expected to have found business opportunities to become self-financing. Having gained access to new markets for their products and services, Chinese companies will have incentives to stay. 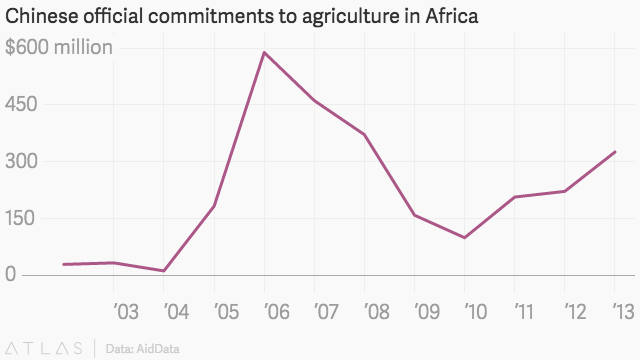 Meanwhile, host countries gain technological know-how needed to upgrade farming practices. This approach, with its focus on mutual benefit, represents one of the most distinct aspects of Chinese aid. It is often combined with loans and investments to make Chinese projects go more smoothly in host African countries. The ATDCs “highlight the Chinese approach to development cooperation that does not separate aid, diplomacy, and commerce,” says Ian Scoones, an agricultural ecologist who researches agriculture and development at the Institute of Development Studies at the University of Sussex. The model doesn’t always work. The ATDC in Rwanda is behind schedule in becoming self-reliant, and has limited funding from Fujian Agricultural University. The center makes a small amount from selling spawns and substrate for growing the crop, but not enough to cover its costs. In some cases, the ATDCs compete with the local farmers and businesses that they are meant to be supporting. The Huye center sells soil, or the substrate for mushrooms, at prices lower than the market rate, according to one local entrepreneur. “My gut is there’s a bit of confusion there. They enable the private sector to get off the ground and they kind of ruin it,” he said. Hu says that the center has always sold the substrate for 300 Rwandan francs (about $0.30) a bag, and has never lowered or raised its price. In other cases, these centers promote technologies or crops that are of little use to the local community. A team of ethnographers surveyed ATDCS in four countries last year and found that several put market concerns over the needs and suitability of the host country. In Tanzania, Chinese staff hailed the superiority of hybrid rice, but maize is the staple of most of the population and rice is too expensive for most. In Mozambique and Zimbabwe, farmers couldn’t afford the modern technologies that the Chinese staff showcased for more productive rice farming. Others complained that the Chinese team failed to teach locals all that much. “It is just a building. We have not yet seen much demonstration,”one local in Mozambique told the team of ethnographers. These coexisting priorities of Chinese aid, development and business, have created some dissent at home. Some officials have proposed the creation of a separate agency for Chinese foreign aid, modeled after America’s USAID. “Is aid China’s instrument for improving political relationships or economic engagement? Which is more important? Because many times those interests are in conflict,” says Sun. Life at the demonstration center in Huye isn’t always easy. Few of Hu’s team have been abroad before. Communication is difficult. Even though they speak English, most of the local farmers they work with do not. Hu has learned enough Kinyarwanda to tell the kids who play in the rice paddies to scare away the birds. Their biggest challenge may be how little their work is known in the community. Outside the gates of the center in Huye, a group of local residents is walking along the highway. Some are going to town while others, carrying hoes and farming tools, are going to the fields. Asked about how beneficial the Chinese demonstration center is to them, one man says that he used to work at the center and attended some of the trainings. This story is part of a series about China’s engagement in Rwanda and reporting was supported by the International Women’s Media Foundation’s African Great Lakes Initiative. Lily Kuo covers East Africa and China's presence in Africa from Nairobi. She previously reported for Quartz from Hong Kong. Before that she covered general news for Reuters in New… Read More.